Buster’s Bistro is one of the Southeast’s most unique bars and restaurants in that it is one of the only true full Belgian restaurants and bars. Customers are raving about our incredible food and amazing Belgian beer selection. 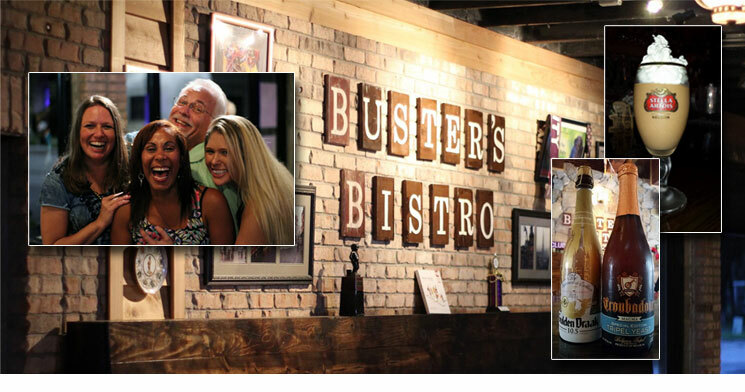 Furthermore, Buster’s Bistro has become one of Sanford’s top music venues with regular performances from the very popular Delirium Band as well as other excellent bands and performers. Belgium has more breweries per head than any country in the world, over two thousand to put a number on it. We have a vast selection of styles and history to choose from. Like kids in a candy store we here at Buster’s do our best to choose the best eighteen draught beers and fifty bottles to best represent the pride and heritage of the motherland of beer. We then do our part to ensure that each beer is served in it’s proper glass designed and provided by the brewery to ensure the flavor is perfect from the luscious head all the way down to the last drop. We top the experience off with traditional Belgian pub fare and an educated staff to compliment the variety of complex and artistically crafted beers we have to offer. We hope to see you soon. Cheers!